An out ‘n’ out Salman Khan Movie, Ek Tha Tiger or ETT (sounds like a sci-fi movie) is a heavy-duty masala entertainer, which is high on machismo & romance. The production team has heavily banked upon the Katrina-Salman real life (past) chemistry, which is also the USP of the film. Even though ETT has been publicized as a Spy Thriller, for me that was not the underlying concept & romance is the central feature of the movie. Though most of the reviews I have read advocate that the film has a weak plot, the story is interesting as it deals with the pros & cons of a secret agent falling in love and the constant struggle between the heart and mind. Having said that, director Kabir Khan (Kabul Express & New York) left a brilliant concept upon the dependable shoulders of Salman Khan and his huge fan following. The treatment of the story is hurried and patchy (making me wonder what’s with Indian spy movies … Don 2, Agent Vinod, and now this), it is extremely low in detailing and more stress has been given to hunting of exotic locales rather than research. Action is slick and a lot of mixed martial arts have been used. Music is average and he videos are colourful. Besides the already famous Mashallah and Tiger Theme, Banjara did catch my attention. The characterization of the secret agent Tiger has been tailor-made to suit Salman Khan’s personality and sense of humour. 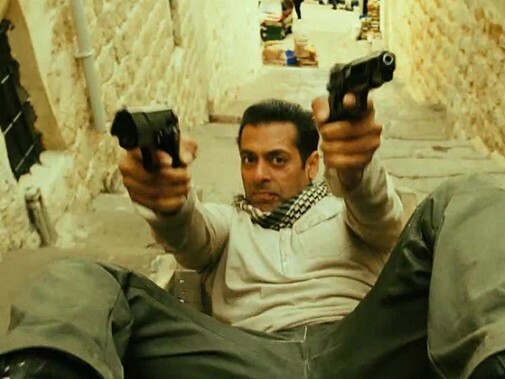 Spooks or spies are hardly pompous and over the top like Salman and it is quite visible throughout the movie that he has tried hard to fit into the character. But, Salman is Salman and you either like him or you don’t. My issue is that I am a huge fan of Salman Khan and please forgive me if I sound biased in this review at places. Salman single handily like his previous movies carry ETT on his strong & dependable shoulders (I already said that). His good looks, signature facial expressions and idiotic sense of humour (which has earned him the largest fan following amongst the masses and movie lover like me) keep idiots like me entertained throughout an otherwise weak movie. Even when he is trying to hide behind the facade of a boring writer to shadow a professor and impress the heroine, he overwhelms you with his regular antics. No matter what the intelligent critics say, Salman’s fan following is not going to diminish with this but steadily grow even though he has looked a tad older in this outing. Katrina Kaif looks WOW and surprisingly contributes much more than other Salman heroines in the past. She has a great screen presence and fits well into the character. She looks amazing in all her scenes and you can’t help being smitten by the beautiful lass. Out of the rest of the cast, Ranvir Shorey is usual and shines in between scenes. The disappointing fact was great actors like Girish Karnad and Roshan Seth are completely wasted with no scope for them in the script, to portray their brilliance. The surprise package in this one is the costumes and the sunglasses (now I would like to own a wardrobe like that). If it was not for Salman and Katrina this movie would have hardly recovered its costs. So, full marks to the production team for casting them and thinking of a brilliant plot, but below average score for a weak script & lack of research. I think you might say that I am insane, but I loved the movie and would not mind watching it again. This entry was posted in Espionage, India, Movie, Review, Television and tagged action, Ek Tha Tiger, Kabir Khan, Katrina Kaif, Martial Arts, Ranvir Shorey, Salman Khan, Secret Agent, spy, Tiger. Bookmark the permalink. I totally agree that it is an out-n-out Salman Khan movie ( I’m a big Salman fan myself…) and the role is kind of tailor made for him. But such was the case with Amit Ji aswell in movies like Sharabi, Coolie etc… so, thumbs up for Salman !! However, I kind of disagree about Katrina’s contribution to the role of a sceret agent. She wasnt convincing at all but definately was the right choice to cast opposite Salman to encash their break up news. Its all about relationship of convenience these days, isnt it !